High-Resolution Image Synthesis and Semantic Manipulation with Conditional GANs. This shows NNs filling in slots in semantic maps (which are actually semantic mattes, and not to be confused with earlier self-organizing semantic maps). How is this with other, more linear processes like sound and narrative? Continuing Alignment in social interactions here. A common strategy to overcome this problem is taxis, a behaviour in which an animal performs a biased random walk by changing direction more rapidly when local conditions are getting worse. Such an animal spends more time moving in right directions than wrong ones, and eventually gets to a favourable area. Taxis is ineffcient, however, when environmental gradients are weak or overlain by `noisy’ small-scale fluctuations. In this paper, I show that schooling behaviour can improve the ability of animals performing taxis to climb gradients, even under conditions when asocial taxis would be ineffective. Schooling is a social behaviour incorporating tendencies to remain close to and align with fellow members of a group. It enhances taxis because the alignment tendency produces tight angular distributions within groups, and dampens the stochastic effects of individual sampling errors. As a result, more school members orient up-gradient than in the comparable asocial case. However, overly strong schooling behaviour makes the school slow in responding to changing gradient directions. This trade-off suggests an optimal level of schooling behaviour for given spatio-temporal scales of environmental variations. This has implications for everything from human social interaction to ANN design. My models indicate that attraction isn’t required, as long as there is a distance-graded awareness. In other words, you align most strongly with those agents that are closest. 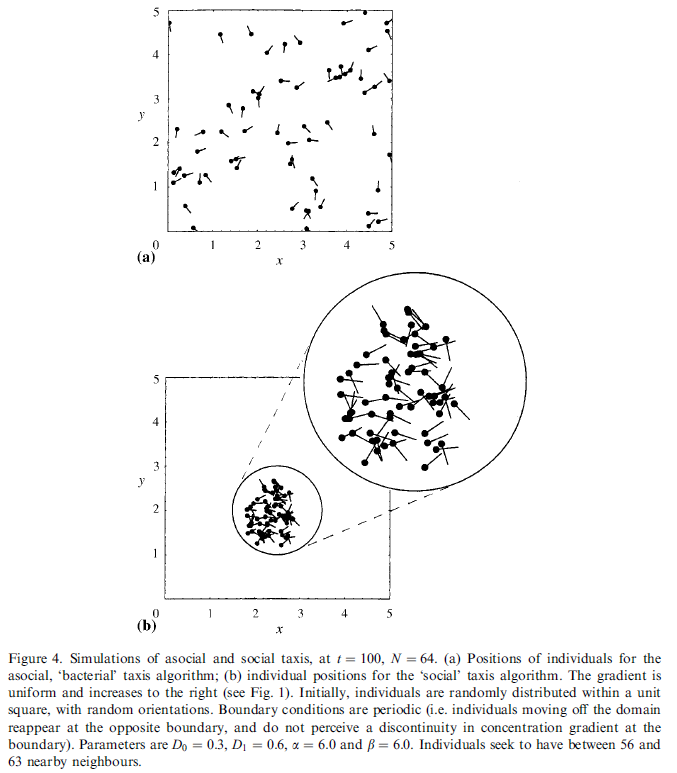 And, I would contend for determining optimal social interactions in large groups. This is something that could be easily added to the model. There could be a multiplier for each data cell that acts as a velocity scalar of the flock. That should have significant effects! This could also be applied to gradient descent. The flock of Gradient Descent Agents (GDAs) could have a higher speed across the fitness landscape, but slow and change direction when a better value is found by one of the GDAs. It occurs to me that this would work with a step function, as long as the baseline of the flock is sufficiently broad. * Though not true of belief behavior (multiple individuals can share the same belief), for a Gradient Descent Agent (GDA), the idea of attraction/repulsion may be important. I think that this should be true in belief spaces as well. It may be difficult to track one person’s trajectory, but a group in aggregate, particularly a polarized group may be very detectable. There is something about the relationship between explore and exploit in this statement that I really need to think about. Surviving as a social animal requires staying in the group. Since belief can cover wide ranges (e.g. religion), does there need to be a mechanism where individuals can harmonize their beliefs? From Social Norms and Other Minds The Evolutionary Roots of Higher Cognition : Field research on primate societies in the wild and in captivity clearly shows that the capacity for (at least) implicit appreciation of permission, prohibition, and obligation social norms is directly related to survival rates and reproductive success. Without at least a rudimentary capacity to recognize and respond appropriately to these structures, remaining within a social group characterized by a dominance hierarchy would be all but impossible. An example where sociality directly affects foraging strategy is forage area copying, in which unsuccessful fish move to the vicinity of neighbours that are observed to be foraging successfully (Pitcher et al., 1982; Ranta and Kaitala, 1991; Pitcher and Parrish, 1993). Pitcher and House (1987) interpreted area copying in goldfish as the result of a two-stage decision process: (1) a decision to stay put or move depending on whether feeding rate is high or low; and (2) a decision to join neighbours or not based upon whether or not further solitary searching is successful. Similar group dynamics have been observed in foraging seabirds (Porter and Seally, 1982; Haney et al., 1992). This entry was posted in Lit Review, Machine Learning, Paper, Phil, research, Simulation, ToRead on December 1, 2017 by pgfeldman.